New Delhi has set up three hydroelectric projects in Bhutan with a total capacity of 1,416 MW, which are operational. PM Tshering arrived in New Delhi on his first foreign visit after taking charge as the PM of Bhutan. India and Bhutan on Friday reviewed the progress of hydroelectric projects in the Himalayan nation during a meeting between Prime Minister Narendra Modi and his Bhutanese counterpart Lotay Tshering in New Delhi. "Development of hydrolectric projects is an important part of the long history of India's aid to Bhutan," PM Modi said in a joint address to the media with PM Tshering after the meeting. Stating that space science is a new area of cooperation between the two countries, PM Modi said that a ground station will be soon be developed in Bhutan by the Indian Space Research Organisation (ISRO) to the reap the benefits of the South Asian Satellite. 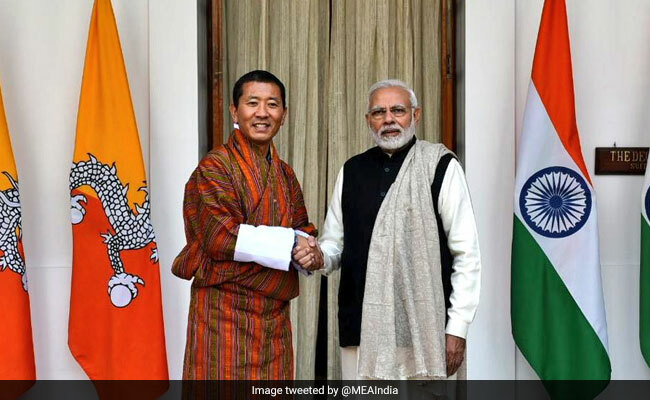 Appreciating PM Tshering's vision of "Narrowing the Gap" on ties between India and Bhutan, PM Modi said that it complements India's Neighbourhood First Policy. On his part, PM Tshering said that the main aim of his visit, taking place on the golden-jubilee year of India-Bhutan diplomatic ties, is to take the bilateral relationship to much greater heights. PM Tshering arrived in New Delhi on Friday on a three-day visit to India, his first official trip abroad after assuming office in October. Tshering's Druk Nyamrup Tshogpa (DNT) party, formed in 2013, won 30 of the 47 National Assembly seats in the elections in Bhutan held in October.